Solar Freezer, DC Powered 12/24 Volt | C4P Inc.
C4P Inc. is a leading solar freezer manufacturer in North America with the largest DC powered chest freezer at 21 cubic feet. With all of our 9, 14 and 21 cubic foot chest freezers, storage space is abundant. The solar-powered chest freezer consumes minimal energy as compared to an average appliance due to C4P’s specialized DC compressor, sealant technology, and 4.5″ layer of polyurethane insulation. 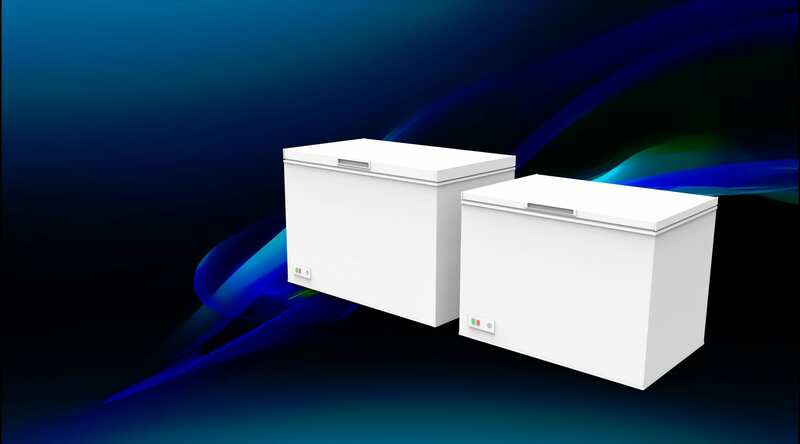 No inverters are needed for operation; these solar freezers can run straight from batteries. All of C4P’s solar freezer models are built from the ground up and wired to operate on DC, which is the energy generated from solar panels. This means having a DC-specific compressor and module, as well as a thicker gauge of cable in order to handle the DC power. Our solar freezers can be operated with a single 220 watt panel and two deep cycle batteries, allowing you to save not only on the cost of an inverter, but also on panels and batteries, as well as the space they take up. The SunStar solar freezer series also features a powdered coated galvanized steel interior for durability and longevity, a double gasket design to ensure the tightest freezer seal possible, along with a powerful cooling fan to enhance the life of the compressor, and in turn, your freezer. All of our solar appliances are equipped with an automatic voltage detection switch, so your 12 volt freezer can flawlessly switch to a 24 volt freezer. C4P Inc. also manufactures a line of solar refrigerators.